Kissing is a rich exchange of informative proteins and arousal hormones. There’s a correlation in primates between brain size and group size, and between monogamy (rare) and males with pointer and ring fingers the same length. Eye shadow mimics the natural darkening of eyelids during ovulation. Breakup and rejection truly hurt: they activate the same brain area as physical pain. These are among the startling facts in this somewhat disorganized but riveting grab bag of love science from evolutionary anthropologist Robin Dunbar. His book is refreshingly different from the typical love-science book: he debunks pop-sci endorsements (oxytocin’s overhyped), speculates about high heels and religious ecstasy, and focuses less on selfish-gene dogma than on the juicy details of what people actually do—as revealed by social-psychology experiments, personal ads, and worldwide anthropological and historical records—to calculate their precise odds and optimal strategies in the mating game. 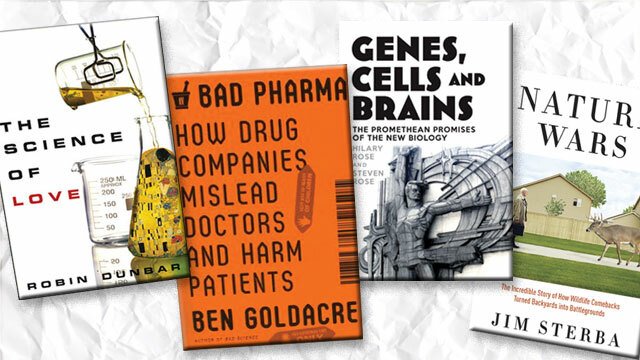 In his first book, Bad Science, British epidemiologist and blogger Ben Goldacre merely sideswiped Big Pharma. Now he has focused his scrutiny squarely on what he describes as drug companies’ permeation and perversion of medical practice—pushing unproven, dubious, even dangerous remedies alongside genuinely lifesaving breakthroughs. Big Pharma, he shows, influences doctors’ prescribing practices not only via ads and sales reps, but by data-mining prescription records, disguising marketing as continuing medical education, and funding both professional and patient associations. More alarmingly, Goldacre draws on unbiased “systematic reviews” that dig up every scrap of evidence—many done by the nonprofit Cochrane Collaboration—to prove that corporations, abetted by ambitious researchers and lax, secretive regulators, taint the very evidence on which safe and effective treatment decisions depend. Negative study results preferentially go missing, making pricey new drugs look better than they are by hiding ineffectiveness and even harm. Published studies are often distorted by poor or deliberate design; many are industry funded, outsourced to commercial companies and developing countries, or even ghostwritten. While he names names, Goldacre stresses that the problem is systemic and can only be changed by informed public outcry. and a neurobiologist—make up-front references to Marx and to “Israel as the last of the white colonizers” that may polarize readers. Yet the Roses’ critique of commercialized, reductionist bioscience is not a polemic. Rather, it’s a detailed and acerbic history of 20th-century genetics: its uneasy dance in and out of the arms of eugenics, its stumbles on the envisioned road to decoding and commodifying human nature, and its upstaging—after the Human Genome Project disappointed hopes for disease cures—by neuroscience, which, in turn, has fallen short of its promises to find and fix the psyche in the brain. So far is this book from a polemic, in fact, that its point can be hard to locate among all the details of antivivisectionism, Icelandic gene banking, and stem-cell politics. In style as in substance, the authors oppose oversimplification—whether by evolutionary psychology, genetic determinism, the brain-fMRI mania they mock as “internal phrenology,” or the “old binaries” of nature-culture, individual-collective, and male-female. They defend “the complexities of lived experience,” now ironically affirmed by the chastening complexity being discovered in genes, cells, and brains. By 1900, white-tailed deer in the United States were nearly wiped out. In 2012, 3–4,000 became roadkill daily. That’s Jim Sterba’s astonishing Nature Wars in a nutshell, a tale of near extermination and resurgence to nuisance levels of species after species: Canada geese, wild turkeys, black bears, and most destructive of all, beavers. What happened? Sterba unfurls a revelatory ecogeohistory of North Americans’ bipolar relationship with their forests and wildlife. After Europeans arrived, a growing human population meant accelerating exploitation—the colonies would not have survived without the fur trade, and the country was practically built of wood and deerskin. The climactic late-19th-century “era of extermination” ravaged nature but spawned the conservation movement, which restocked and protected species while farmland shrank and forests grew back. Ultimately, “denatured” people raised on supermarket food and Disney movies collided with resurgent forests and critters in the new shared habitat of exurban sprawl, where, for instance, geese pollute reservoirs, but until they brought down an airplane, culling was protested as a “goose Holocaust.” This book will change you. I ended it pro-hunting—it’s more humane and far less wasteful than roadkill.